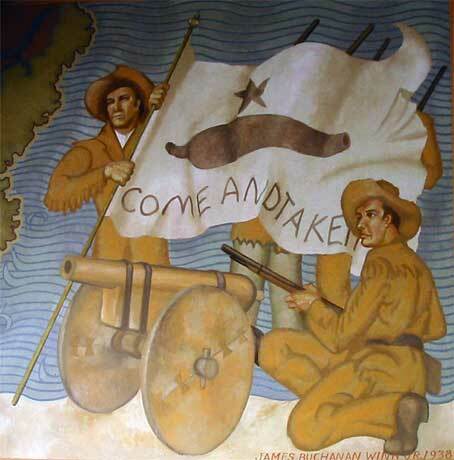 Allegedly flown in the first battle of Texas’ revolution against Mexico, in October 1835, the flag depicts the legend “Come and Take It” under an old cannon Mexico had given to the DeWitt colonists to defend themselves against Native Americans. Under Santa Anna, Mexico began taking away the colonists’ arms, and requested the cannon back. The colonists, freaked out by the increasing dictatorship, said No, but thank you; we’ll keep the cannon. Mexico sent soldiers, but instructed them to avoid conflict if possible; the Texians fired on them; the Mexicans retreated. Click to buy the shirt!